I’m not a big risk taker in my life. I try not to tick off the Grim Reaper, keeping him at arm’s length as much as possible. 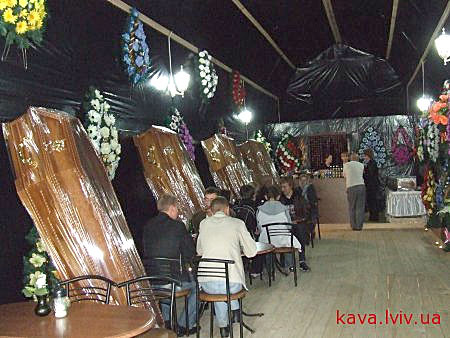 I’m wondering what the owners and patrons of a new eating establishment in the Ukraine were thinking when they mocked death by building a theme restaurant named Eternity centered around the funeral experience. I thought I’d seen caskets pushed to the nth degree when I read about the Crazy Casket company in the UK. 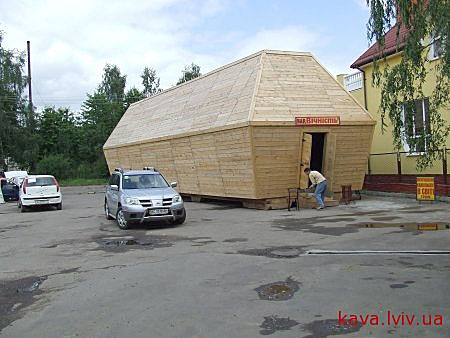 Undertakers built what they hope Guinness will recognize as the World’s Largest Casket. Inside this giant wooden death box, the owners have put in tables and a bar and are serving meals with names that recall mourning rituals. Funeral floral wreaths hang on the walls and normal-sized caskets are propped against the walls between tables. I’m guessing the Goth crowd is making reservations right now for lunch and dinner. Thanks, but no thanks. I’ll stick with McDonald’s. Here are a few pictures but more are available at www.kava.lviv.ua.